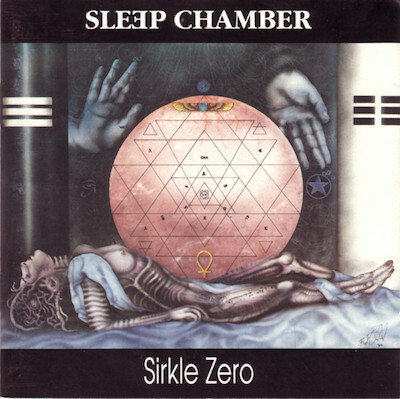 John Zewizz (nee McSweeney, heh) and his many collaborators are Sleep Chamber. Formed in the early 80s, they became the center of an American outpost of England’s hidden reverse based in, of all places, Boston. Over the decades, they developed a reputation for their use of extreme imagery and drug-fueled live performances. But like a lot of stuff from this era, when you peel away the leatherette, the music itself is surprisingly tame. On this 1990 record, there’s disturbed strings (T1, T12), thighbone horn and flute, satanic spellcasting vocals (T2, T5, T7, T8), plodding industrial beats (T3, T5, T6, T8, T11), and foggy atmospherics hanging over every track. This is more of an ambient sounding project than the band’s other releases, like the background music for a dungeon party. Thankfully nothing here is as cringey as, say, Catwoman. Take a look at Zewizz’s online presence, like his entertaining blog or the triumphant responses to each of his haters’ comments on his various Discogs pages, and maybe you’ll become convinced as I did that he possesses the exact strain of damaged madness that KFJC needs to protect, preserve, and champion.